Backups are a necessity even if they are tedious. For myself, I generally use two methods: SyncToy to copy files from the main drives inside my PC to an external drive and system images to create a complete backup of the main drive for restoration in the event of a serious failure. 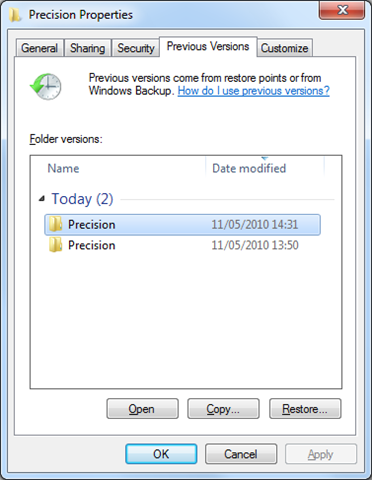 With Windows 7, one of the benefits of system images is that if you tweak the security permissions so that you can access the files, you can then mount the VHD file as a drive letter and copy files back out, so it doubles-up as a file-level backup. I’ve been frustrated recently though by the fact that whenever I’ve created a system image, previous images for the same computer have been deleted. Everything I’ve read suggests that this would only happen for backups to network locations and that backups to physically connected drives would support multiple backups so long as there was enough disc space. Today, I learnt how to enable that feature! The secret lies in enabling “Previous Versions” a.k.a. System protection, on the drive that you are saving the backup to. I struggle to remember where to find this and how to turn it on, so here are some instructions. 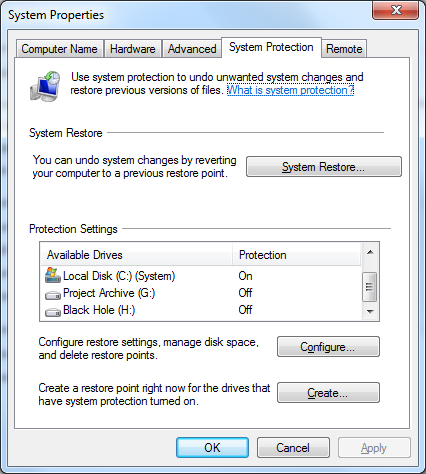 Typically, protection is enabled for the main, system drive. To enable system protection on the drive that you want to save the backups, select that drive and click on the Configure button. 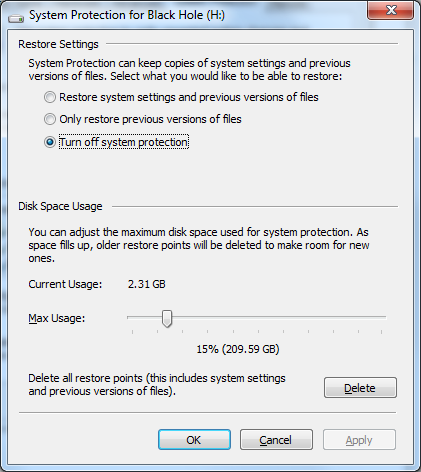 You want to select the second option – Only restore previous versions of files. Next, you need to decide how much space you want to allocate to system protection. Now, the thing to understand here is that Windows only needs space for the differences between files. So, for example, if your system image is 360GB, you don’t necessarily need 360GB of free space as subsequent images will only be the differences and should be smaller. That said, the more space you give to this, the more versions of the backups that can be stored. Also note that a warning will appear: Using system protection on a drive that contains system image backups will cause other shadow copies to be deleted faster than normal. System protection essentially uses a reserved amount of the disc space to act as a version backup of any file that gets changed on that drive. As the reserved space fills up, so older versions get dropped. As a result, if you are saving system image backups to the drive, because these can be quite big, this is why you could see other file backups (i.e. the shadow copies) being deleted. Again, the more space you give over to system protection, the longer the shadow copies will be kept for. The choice, ultimately, is yours. Once you’ve changed the settings, click OK and then OK again to close System Properties. However, because the permissions on system image backups are really tight, i.e. even as an administrator you would not normally be able to access the files, accessing a previous version of a system image backup is tricky. I’m still researching this. I’ve found, for example, that if you modify the permissions on the folders and files before you perform a subsequent system image, the modified permissions go with the Previous version and so you can readily open/copy the files. However, if you don’t modify the permissions, I don’t have an answer yet. What is worse – and somewhat negates the value of Microsoft’s implementing system image backups this way – is that if you try to restore from a system image, you will only ever see the most current image. The tools to restore the system image don’t seem to have access to the Previous versions data. The second thing I learnt today about backups is that if you want to create a system image, you don’t only have to do it through the Create a system image option under Backup and Restore. If you’ve only got the one drive you want to image, you can actually handle this within Windows Backup. This gives you the further advantages that it is then easier to perform an on-demand backup as all of the settings will be preset for you and/or you can then schedule the backups. Furthermore, Windows Backup has been enhanced from the version in Vista so that it doesn’t just backup files it wants to. It can do this still but you now have the option to have complete control over what gets backed up. You can now drill down the directory structure to select the folders that you want to back up. Note that you can only select at the directory level with this tool – you cannot select individual files within a directory. One thing to note is that if you use Windows Backup to only create a system image, i.e. you don’t use it to back up directories, then the Backup and Restore control panel applet will report that it cannot find a backup to restore from. This is because the system image is not intended to be used with the restore functionality. System images are intended for use when you boot from the Windows 7 installation media and choose the recovery tools. 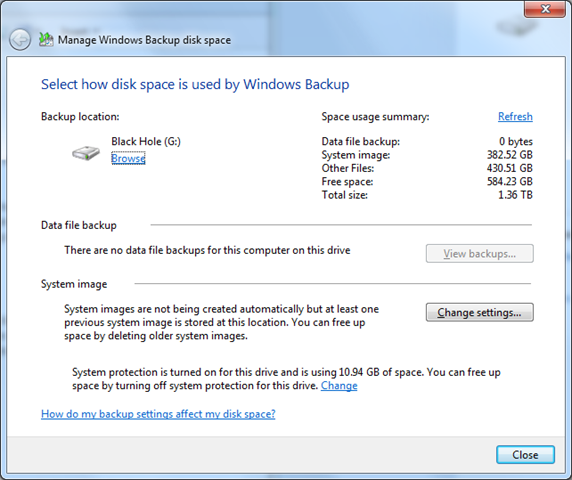 Backups with Windows 7 have got more sophisticated and easier to manage now! Yeahhhh… but have you ever successfully restored anything from a Windows 7 Backup?